Food shortages have forced Scotland's seabirds to attack and kill chicks from neighbouring nests, experts have found. Leeds University researchers said young guillemots on the Isle of May colony, in the Firth of Forth, had been pecked to death or thrown off cliff edges. The study revealed that adult guillemots were having to spend so much time finding food in the last year that parents were leaving chicks unattended. In the past attacks on chicks were extremely rare, the researchers said. In July, the RSPB warned that the poor breeding of Scotland's seabirds was giving cause for "serious concern". 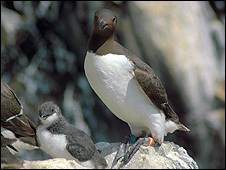 It said guillemot eggs had been left abandoned on cliffs as parent birds spent more time at sea in a search for food. However, the latest study suggested that the problems do not end when chicks are successfully hatched. Adult guillemots were having to leave their chicks completely unattended, putting them at risk from exposure and the weather. But many more died because of attacks from birds raising their own chicks on neighbouring nest sites, according to the study. The scientists said the birds responsible were stressed, hungry and determined to stop other chicks from receiving food. The findings have been published online in the Royal Society Journal Biology Letters. The experts said it indicated that social harmony, even in long-established colonies, could break down if conditions toughened, for example if the prospect of starvation looms. Kate Ashbrook, author of the study, said: "The attacks were brutal and usually involved more than one adult as chicks fled from the initial attacking neighbour. "More than two thirds of all documented chick deaths in the sample area were caused by attacks from neighbouring parents. "Yet this particular colony has been monitored for almost 30 years, and in that time chick attacks have been very rare." Guillemots rear only one chick during the breeding season, which runs from April to July. Because the young birds are vulnerable to attack from predatory gulls, parents rarely leave them unattended and take it in turns to find food. However, a decline in prey in recent years has led to both parents being forced to search for food at the same time. The researchers witnessed almost half of all chicks unattended at some point during the day. Co-author Professor Sarah Wanless, from the Centre for Hydrology & Ecology, said: "This research highlights how fragile the social fabric of a seabird colony is. "Having a stressed, hungry neighbour isn't good news if you're an unattended guillemot chick."